One of our new Santa Maria self catering apartments, this property has one bedroom and enjoys air con and a lovely sea view from the balcony. Have just returned from a really relaxing and enjoyable holiday in Tenerife, which we booked through Karen from Holidays 4U. We stayed on the Santa Maria complex in the San Eugenio area. We have stayed many times before on this complex and love it. The apartment that we booked through Karen had really good sea views and it was in the main block overlooking the pool. We have found that a lot of the apartments have air conditioning, and it is really good idea to book a privately owned apartment and check that it has air con, as it is hard to cope without, especially at this time of year. The apartment was clean when we arrived and there was a small welcome pack waiting for us including a bottle of water. 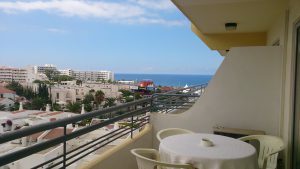 This complex is in a great location on the resort as it is just across the road from Torviscas beach. There are plenty of restaurants, bars and cafes within easy walking distance. We tried the water sports this time which was great fun. The pool area on the complex is very nice with plenty of sun loungers and sun umbrellas. There is a very nice pool bar as well, which offers a good selection of drinks. We were certainly very glad that we booked the apartment on a self catering basis, as there were lots of lovely restaurants which we tried out each night. I wasn’t interested in cooking in the apartment. Holidays are supposed to be for relaxing and getting away from the usual pattern. This entry was posted in Tenerife Apartments and tagged #holidays4uorg, #karendurant, #santamariatenerife, #tenerifeapartments by holidays4u. Bookmark the permalink.